In the last week of February, I won’t publish any post about tutorial or creating another photoshop goodies to download. I think it is about time for Graphic Identity Blog to step outside, to see what’s going on in the internet world. Yes, nothing would be so much pleasurable, when you meet new people, sharing inspirational thoughts, and learning to reduce your own mistakes from other bloggers. For that reason, I took chances to spend a moment to build a strong social networking with great bloggers. Blog promotion comes as another benefit when you unite in a social networking event. It could be a moment to take this blog for re-evaluation and reviews to present better content for Graphic Identity Blog readers in advance. Vivien of InspirationBit.com has been setting a new deadline for the submissions to the Social Media Mega Project and giving everyone another full month of trying out different social networking sites and sharing your experience with the rest of us. Take a look and see which social media site you’re interested in and would like to submit your entry to. Together the project covering 19 social networking sites, so you’re bound to find something that appeals to you. What Bloghology is all about? Bloghology is a collection of unique and remarkable bloggers and their profiles from all around the internet world compiled in PDF files to download. Mert Erkal http://www.searchforblogging.com/ invented the term of Bloghology and he is taking part to develop Peopleized.com. Graphic Identity Blog apparently gets the opportunity to be featured in 2nd Edition of Bloghology. 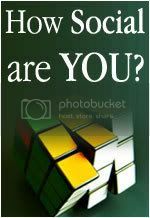 If you want to be part of this Bloghology movement, sign up at www.bloghology.org to get your blogger profile featured. It will continue every quarter in 2008 and open to all bloggers. The number of downloads for Bloghology PDF files exceeded 4500 until February 19, 2008. The numbers keep growing on and on. Bloghology is something insightful and powerful feature to promote your blog in a very exceptional way. Jacob Cass includes me to be one of the sponsors for this project. The entries for this group writing project keeps flowing in and it will end in Tuesday 4th of March. This project is open for everyone, even though you’re not a graphic designer. There are lots of link love for the participants and great prizes to win! It's been so wonderful when I meet Collin, who offers me to do the sponsorship for the FeedFlare’s upcoming contest. It would be held on March and I’m going to design a pack of new blog branding identity that will include a blog header, blog logo, favico, and 125x125px multi-purpose banner. 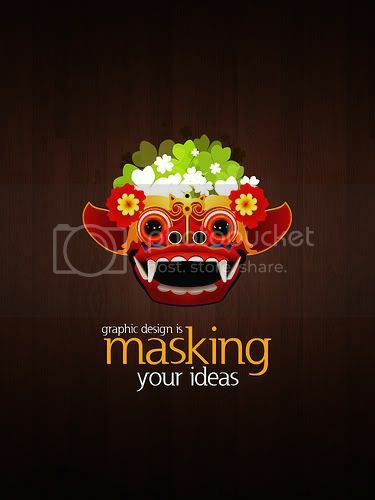 Thus for you who is interested to join it, just be connected to Graphic Identity blog for next updates about this contest! Consider to experiment actively at those widespread blogging activities that I’ve mentioned above, be nice to give everyone favors and that what make all of your effort to build strong social network stand-out! I could have posted this design competition announcement earlier, too bad I found about it late after digging links to some design forums when the submission deadline was only two days left to go. Veerle never provides email subscription to her blog, I got a little upset to my self, why I didn't subscribe to any feed reader before. 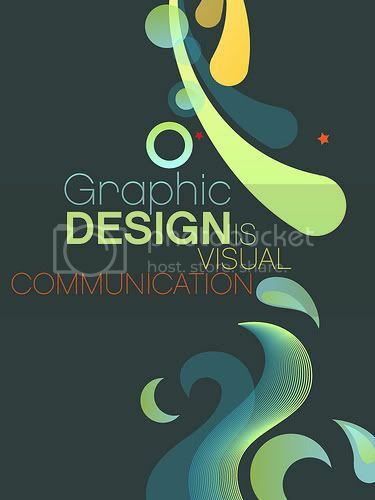 The basic concept of this contest is to come up with something creative or witty that visualises the question 'What is Graphic Design?'. Veerle is the only judge and jury for the contest and she gathered attractive prizes to win from sponsors like Adobe Creative Suite CS3, Expression Engine CMS and much more. Veerle put forward her own poster design, and got interesting comments by other Flickr users. :D She used the same color scheme as shown on her blog, but the design visualized what Graphic Design is in different typos. The closing date was 15 February 2008, and the contest got the mass attention nearly up to 600 design submissions. As some of you probably know that Veerle's Blog gets PR 8, so this should not be a surprising thing if you find enormous numbers of great poster design entries. You can surf down to enjoy each entries in a Flickr pool group called: What is Graphic Design Poster Competition. This was my final shot only in 24 hours before the deadline ;p "Feeling Red" LOL it could have been more worst than this one. Check out and please comment and give your critique if you wish. You can also put your comment to the group pool by login to Flickr or register first if you still don't have Flickr account. 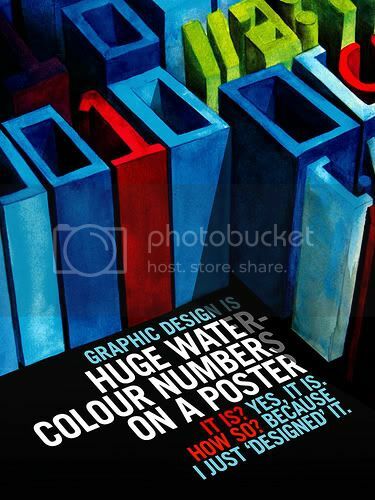 Veerle has featured some of the contestant entries for What is Graphic Design poster competition and they really are outstanding in every aspect of design. She said that her readers are creative bees! Here is my favorite one, designed by gravitymachine, this poster just captured my eyes right away. See the other winners and please give their wonderful designs a comment! Gravitymachine gets the runner up prize, as I have previously shared you their design entry and I'm so happy that my favourite choice turned out to be one of the winner. Not bad at all guys :D, congratulation to all the winners! This month, I’ve committed my self to enhance my network by sponsoring several blog contests and a Group Writing Project held by JustCreativeDesign.com. Jacob Cass is the man behind this wonderful project. He is exclusively running the contest to bring all the design freaks, graphic design blogs and people who subscribe to them a bit closer together with $5000+ worth of prizes to give away. I must say that winning the contest could be sounds so much fun, but then again what I love the most about this project is the opportunity to enhance your network, to link and be linked in with other participants. Your blog would have been nothing if you hold yourself away from the crowd. Participate to meet new people, to link love, to surf the submissions, leave comments and make connections with other fellow graphic designers & subscribers alike would dazzle the fun into hilarity to this group writing project. My part in this contest is listed in Bonus Prize Sponsors. You could be the one who win A Blog Header design that is created by Graphic Identity team ;p.
I should add few more the updates regarding to the contest, that Jacob Cass will still accepting late sponsor up until the prize draw date. Sponsors are able to enter the contest; however you can not win your own prize. The entries deadline will be on Tuesday 4th of March. How to participate in this Group Writing Project? This contest is open to all of you, even if you’re not a graphic designer. All you have to do is to write a new post on the subject of Graphic Design, and re-posting old article for this project is not OK.
By ‘Graphic Design’ I mean some sort of a post that gives advice, tips, resources lists or a tutorial on how to do something. What it’s about is totally up to you. Read the rest of the Graphic Design Group Writing Project rules for the details before you start your entry submission. Give your self a try and get “Connected” to JustCreativeDesign.com Group Writing Project! Have fun by collecting much entry points as much as possible to win $5000 prizes give away! Diana and Simonne collaborate to start a blog about how to make money online called EzMoneyOn.Net. This blog present you great writing articles about tips and tricks to make living from internet. There are a lot of make money online blogs, we know that. Some of them are quite successful in making money, many of them have some articles and that's it. But on how many "make money online" blogs do you really learn how you can make money online? I still find on many forums bloggers who ask that. The EzMoneyOn.Net blog authors present you the case studies, so you can choose what way suits better to your blog. This brand new blog held the first contest since February 11th, 2008, and incredible prizes are waiting for you to participate to the contest. You can always have the opportunity to win first prize $100 cash, 1000 Entrecard credits for the second run winner and free banner design since this is a draw prize contest for the third prize. Find out how to join this contest and remember the closing date to submit your entry should be on 11 March 2008. There are so many ways to promote your design blog niche. If you're still doing promotion to some specific design forums, there's nothing wrong to try general blog community for more campaign activity to your blog. A general blog community should always include design category or art category inside. Accordingly, there would be easier for the viewers to find your blog inside the community. This article is updated, after almost a decade since it was published :D.
There were 8 once-new blog communities I mentioned in the initial post version, but only one that is still existing till now, which is Blog Engage! Blog Engage is actually featuring general blog topics but they include 'Design' category for everyone who wants to submit their article there. For more relevant content, you can visit a newer post from Webtoolhub.com entitled: 25 Top Websites to Submit Web Design Articles and News. 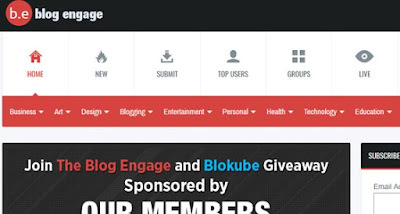 Blog Engage is also mentioned in the round up links there! Do you know any other new general blog community that you are currently join on? Why don't you share with us why you like being part of it? 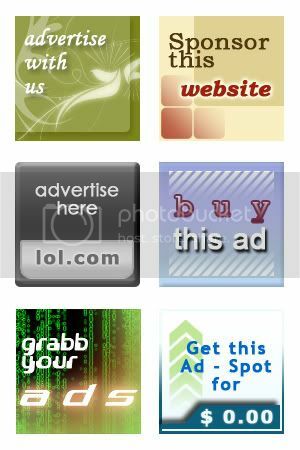 I designed 6 diferent theme buttons. They are in .PSD format, so it should be easy for you to edit the fonts or the layer elements inside. Being around with several simple tutorials about typography and general design using Photoshop, we will now move to specific design styles in a series that will continue for some time now, to start with Grunge Urban Art Style. 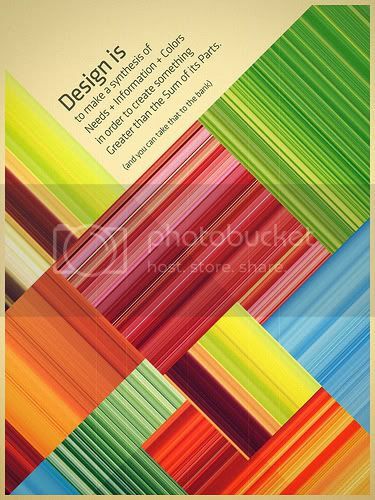 Before we step further, you will need sorts of design elements to create such design style. You don't have to worry, because all those design elements are actually available for free on the internet. 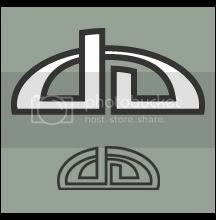 I have great listings of Grunge Urban Art design resources just to help you to figure out what they're look like. When you use one of those resources, please credit the original designers for appreciation and read his or her design copyright before you apply them to your design. The best font type I suggest would be typewriter fonts or grunge fonts that have heavily texturized effect. Every kind of graffiti typography and industrial print alike are perfect example font styles. Grunge style frequently related to urban style in particular. Urban life in the crowded city, with graffiti walls around. High rise building a photograph or the cityscape around your neighborhood will do for this purpose. Hence, you can pick: electricity towers, building construction works, or even a factory building as background or silhouette to your grunge design. Mood in a grunge design often associated with black color. Black is a hint of power and superiority of a metropolitan society. Another dominant color that plays the role is dark grey, which is a sophisticated connotation of stone and concrete. You can find the complete color schemes suggestion in the resources lists. Creating grunge design is always been fun, because it's always associates with irregularity and erratic method. The best textures to use are splatters, blood, water colors, noise and scratch. You can apply these textures using Photoshop brush tool, or Photoshop pattern. I've seen some grunge design styles that are also quite psychedelic. The common trends could have been light beams background shapes. 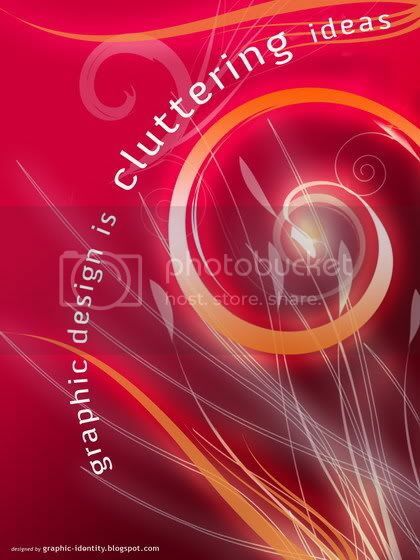 A grunge floral vector that has erratic texture will work as well. If you need a photo or model to display, I recommend you to use pop art or line art Photoshop retouch effect. Ow, by the way, this tutorial is just another way to create "grunge urban" design. You can find other similar Photoshop tutorials, photoshop goodies (brushes, patterns, and shapes), fonts, and vectors from other sites. If I missed something, you can just comment or even show me your own design to improve it :). In this tutorial, I will show you how to create grungy wallpaper. One of my good friends, Abhinav Sood was so generous to let his photo being edited for this tutorial ;p. Thank you Abhi! Depends on what kind of design that you want to create, it is very crucial for you to pick several colors (4-6 hues in a colors scheme) before you add another elements. Too much variation of colors will diffuse the design emphasis. You can take a look of the color scheme option in the resources list and pick 6 maximum of them that you think would be the best color combination.